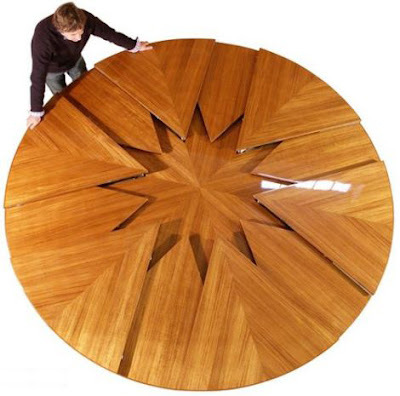 Magic table that stretches all the countries - This is the world’s only round table, which can change its “capacity” from 6 to 12 people, ballooning in diameter, but while remaining perfectly round. Although extensible tables are usually associated with inadequate living space and the forced effort to compromise, a device is intended for millionaires. People buy expensive items in a number of reasons. First, expensive item is the prestige as an image of style and manners. Secondly such a thing was created by a famous brand, but it is full of quality and environmentally friendly materials. Third, expensive object might be created by a particular designer or artist, and then it is a work of art can provide the owner with nothing-incomparable aesthetic pleasure. Furniture Company DB Fletcher, based in the U.S. and Britain are exclusive, designer, hand-made items designed by artist David Fletcher (David Fletcher). As is appropriate for expensive products are made of valuable breeds of solid wood, featuring a phenomenal strength, reliability in operation, great design and modern look. However, we are interested in them otherwise. Many products of DB Fletcher stand still and very original design. As such, the unique “table-Fletcher capstan” (Fletcher Capstan Table). 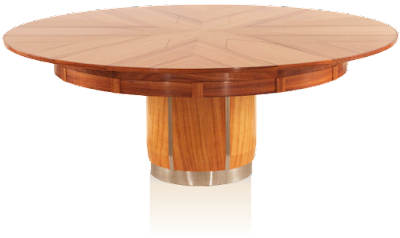 Fletcher Capstan Table is a work of art, both in terms of design and in terms of engineering. This should be seen: first before you is a round table, but if you grab the end and rotate it counter clockwise 30 degrees, desktop “breaks” into six parts. These sectors rose slightly a few inches up, simultaneously stretching away to crawl under them make additional six sections and a central angle of 12 stars. All panels are placed on one level and is again before us a round table, but with a larger diameter. It works very quickly, the whole process takes about four seconds. The mechanism works very consistent and accurate, its only drawback is the noise caused by the transformation of the counter top. 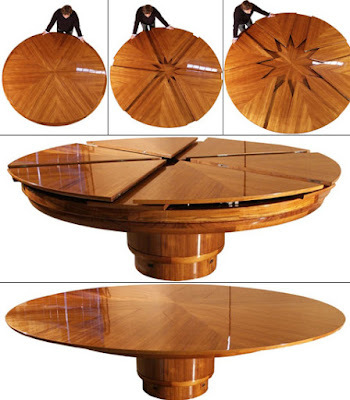 Fletcher Capstan Table is available in several variants, differing in size and breed of the tree. However, in all sizes crucified mass is practically twice larger than its initial shape. 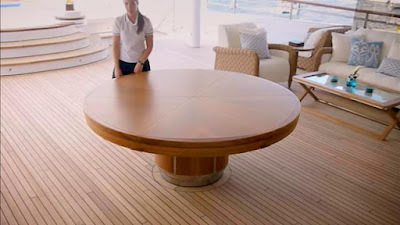 Some models Capstan Table is intended for use on board a luxury yacht, at that – the open deck. Therefore, their surfaces resist salt spray and humid sea air. David Fletcher himself not once stated that his furniture can be acquired only by very rich people and managed. The furniture of this artist is not for everyone, but not ceases to strike our imagination with exceptional design engineers and findings.